Purpose: Seeking, associating with, and building power. The White Court and the Black Court are roughly equivalent to one another. 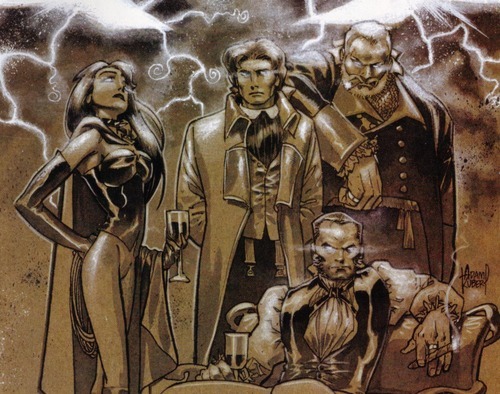 In general, those of the White court have tended to be more openly charismatic and have better visible connections outside the Club, while those of the Black court have tended to be those with lower profile or more secretive power bases, including criminal enterprise, secret cults, magical influence and the like. But these are not hard and fast rules, just tendencies. The Queens and Kings are the most influential, powerful and charismatic figures. They set the tune everyone in their court dances to. The two courts are often at cross-purposes with each other, or at least being very competitive about which particular paths or ideas can be most successful. The Queen and King of a particular court are usually allied to one degree or another. They may trade barbs, and betrayal is not unheard-of, but usually they work together against their opposite numbers. The Rooks are generally viewed as the most powerful of their courts outside of the royals themselves. They are the primary agents, or lieutenants, of their respective royals. At a minimum, this means that they are the most loyal and dedicated. It also usually implies that they have a powerbase of active agents loyal to them outside the Club, to help put into play the dictates of their royals without ever necessarily revealing who is giving their marching orders. The Bishops are typically chosen allies of their particular royals, brought onboard because of a particular access or resource they can provide. This can be anything from a particular power they have, to a company or organization they can bring to bear on the Royals' plans. Note that if it's a power, it's usually not something of a simple bruiser type, but something moderately unusual and key to bigger plans than just 'taking on the heroes' - though it may be very useful in that regard too. The Knights are chief enforcers, leaders of the Pawns who populate the lower ranks of the faceless minions of the Club. These are generally not just bruisers, but intelligent leaders in their own rights, just at a much lower level to the royals.